With two major grants, UNH researchers Serita Frey and Stuart Grandy will investigate the role of soil microorganisms on climate change. 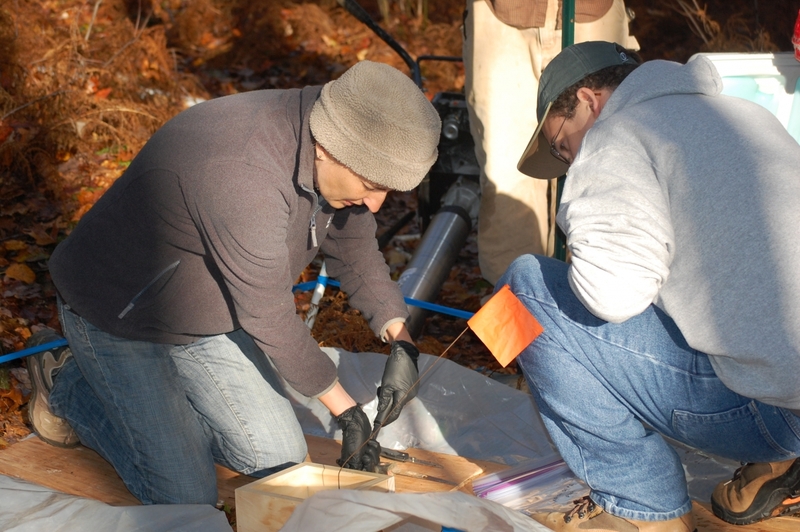 Serita Frey, professor of natural resources (left), and a graduate student take soil samples. Soil microorganisms play a critical role in the amount of carbon dioxide and other greenhouse gases released into the atmosphere, which is a central factor in climate change. University of New Hampshire scientists received $1.5 million in federal grants as part of an effort to better understand the physiology and genetics of these soil microbes, how human activity is altering them and the implications for the global climate. The researchers, Serita Frey and Stuart Grandy, have received grants from the U.S. Department of Energy and the U.S. Department of Agriculture to understand the genes that underlie how soil microorganisms use carbon. “Soils breathe just like humans breathe—that is, soil microbes take in oxygen and release carbon dioxide and other gases into the atmosphere. Soil microbes add 10 times more carbon dioxide to the atmosphere than fossil fuel emissions on an annual basis. However, under natural conditions this microbial release of carbon dioxide is balanced by plant uptake —microbes release carbon dioxide and plants take that up through photosynthesis. When humans disturb soil—through agricultural activities or climate change—soil microbes can add excess carbon dioxide into the atmosphere,” says Frey, who is a professor of natural resources. 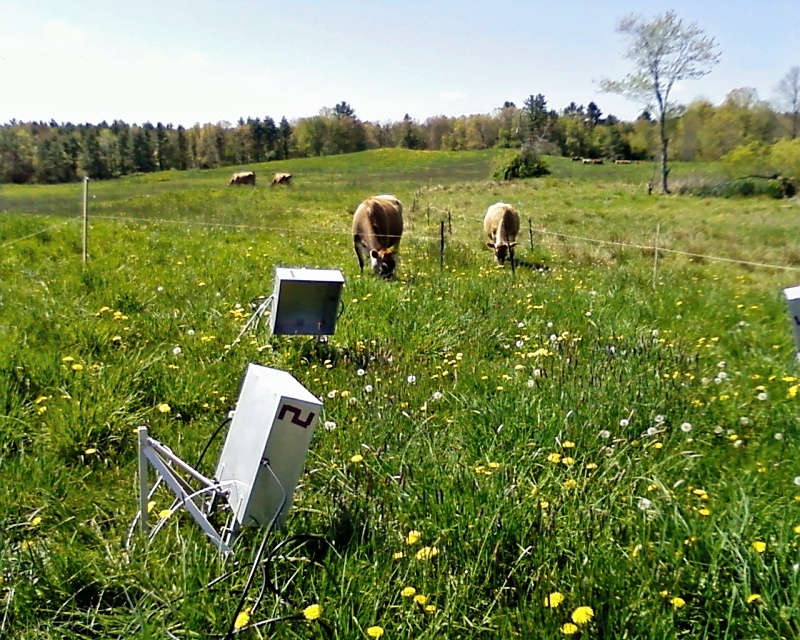 Autochambers at the UNH Organic Dairy Research Farm measure soil respiration. “We’re interested in understanding the factors that control microbial respiration — what causes them to lose more carbon dioxide to the atmosphere vs. what activities might do that in reverse, reducing the amount of carbon dioxide in the atmosphere,” Frey adds, noting that there are about 200 billion microbes in a handful of soil. Globally, surface soils have lost 25 to 50 percent of their carbon over the last 100 to 125 years during the period of intensive cultivation globally. This carbon is now in the atmosphere as carbon dioxide. According to Frey, more effective soil management could reverse some of this loss by altering microbial processes to restore some of this soil carbon. Incorporating these microbial processes into models allows scientists to evaluate the soil management practices that can restore soil carbon globally, says Grandy, an associate professor of natural resources. Modeling is a key feature of these grants, allowing Frey and Grandy to assess the broader implications of variation in soil microbial communities. This material is based upon work supported by the NH Agricultural Experiment Station.